The kids could eat tacos every night I think. Unfortunately they prefer their's of the meat-and-cheese-only variety. I'm all about the veggies and toppings. 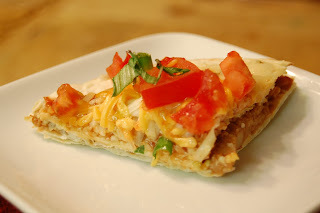 Here's a recipe that makes it easy to compromise: "Fast Food Fix" Taco Bell Mexican Pizza. Each individual "pizza" can be customized to suit each person's tastes. DS had his with only meat and cheese and mild sauce while I had mine with refried beans,tomatoes and hot salsa. These were easy to make and pretty quick since you bake them all in the oven at the same time. This is definitely a recipe I'll be pulling out on a regular basis. In a small bowl, combine the seasoning mix, chili powder, paprika, and water. Stir until smooth. Set aside. Preheat a small nonstick skillet over medium-high heat until drops of water sizzle when splashed on the pan. Crumble the beef into the pan. Cook, stirring with a wooden spoon, for 2 to 3 minutes, or until no longer pink. Stir in the reserved seasoning mixture. Cook, stirring, for 1 to 2 minutes, or until no liquid remains. Remove from the heat. Cover to keep warm. Place the tortillas in a single layer on a nonstick baking sheet. Bake for 3 to 5 minutes per side, or until just crisp and starting to brown. If air pockets form during baking, carefully pierce with a fork and press down to deflate. Leave the tortillas on the baking sheet. Spread 1 tortilla evenly with the beans, leaving a bare 1/2-inch border. Evenly spoon the beef mixture over the beans. Top with the remaining tortilla. Spread evenly with picante sauce, leaving a bare 1/2-inch border. Sprinkle on the cheeses in layers, first the jack cheese, then the mozzarella cheese, and last the Cheddar cheese. Top with the tomatoes and onions. Bake for 5 to 7 minutes, or until the cheeses melt. Cut into 4 wedges.